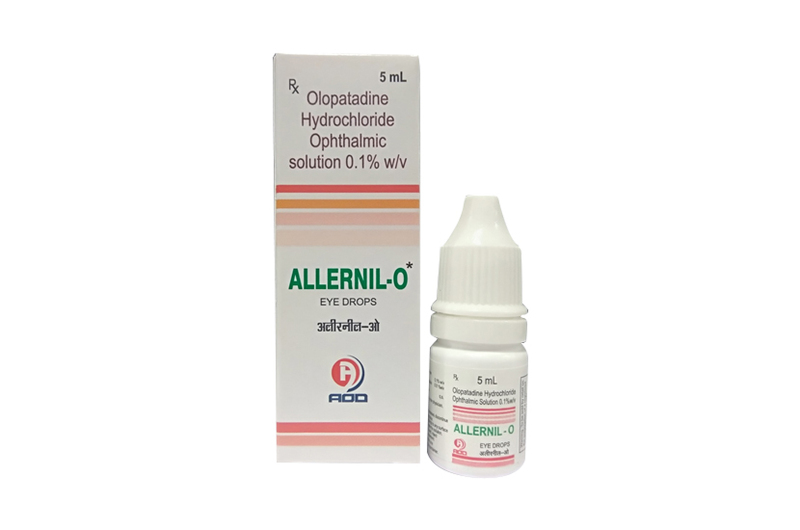 Allernil-O Eye Drops (Olopatadine Hydrochloride Ophthalmic Solution) is a sterile ophthalmic solution containing olopatadine, a relatively selective H1-receptor antagonist and inhibitor of histamine release from the mast cell for topical administration to the eyes. Olopatadine is an inhibitor of the release of histamine from the mast cell and a relatively selective histamine H1-antagonist that inhibits the in vivo and in vitro type 1 immediate hypersensitivity reaction including inhibition of histamine induced effects on human conjunctival epithelial cells. Olopatadine is devoid of effects on alpha-adrenergic, dopamine and muscarinic type 1 and 2 receptors. Following topical ocular administration in man, olopatadine was shown to have low systemic exposure. Two studies in normal volunteers (totaling 24 subjects) dosed bilaterally with olopatadine 0.15% ophthalmic solution once every 12 hours for 2 weeks demonstrated plasma concentrations to be generally below the quantitation limit of the assay (<0.5 ng/mL). Samples in which olopatadine was quantifiable were typically found within 2 hours of dosing and ranged from 0.5 to 1.3 ng/mL. The half-life in plasma was approximately 3 hours, and elimination was predominantly through renal excretion. Approximately 60-70% of the dose was recovered in the urine as parent drug. Two metabolites, the mono-desmethyl and the N-oxide, were detected at low concentrations in the urine. Results from an environmental study demonstrated that Allernil-O Eye Drops (Olopatadine Hydrochloride Ophthalmic Solution), was effective in the treatment of the signs and symptoms of allergic conjunctivitis when dosed twice daily for up to 6 weeks. Results from conjunctival antigen challenge studies demonstrated that Allernil-O Eye Drops (Olopatadine Hydrochloride Ophthalmic Solution), when subjects were challenged with antigen both initially and up to 8 hours after dosing, was significantly more effective than its vehicle in preventing ocular itching associated with allergic conjunctivitis. Allernil-O Eye Drops (Olopatadine Hydrochloride Ophthalmic Solution) is indicated for the treatment of the signs and symptoms of allergic conjunctivitis. Allernil-O Eye Drops (Olopatadine Hydrochloride Ophthalmic Solution) is contraindicated in persons with a known hypersensitivity to Olopatadine Hydrochloride or any components of Olopatadine Hydrochloride Ophthalmic Solution. Allernil-O Eye Drops (Olopatadine Hydrochloride Ophthalmic Solution) is for topical use only and not for injection or oral use. Allernil-O Eye Drops is supplied in one White polethylene Bottle packed with printed labelled & cartons And Such 25 Carton Packed in a Shrink Sleeves & corrugated box.